Get an Exclusive Marvel TV Poster at San Diego Comic-Con | Marvel's Agents of S.H.I.E.L.D. Can't wait for season two of Marvel's Agents of S.H.I.E.L.D. and the premiere of Marvel’s Agent Carter? Then stop by the Marvel Booth (#2329) at San Diego Comic-Com for a free Marvel TV poster! 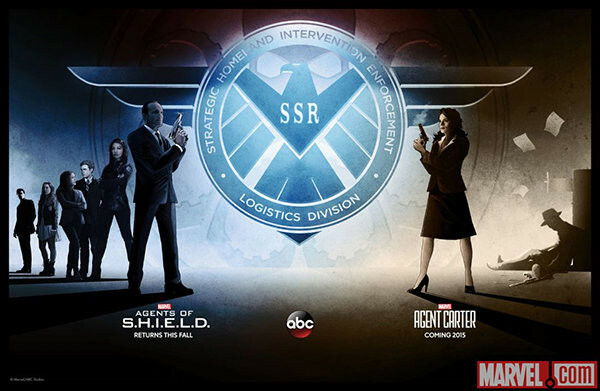 This poster is the first artwork to feature both Marvel's Agents of S.H.I.E.L.D. and Marvel’s Agent Carter, and is available exclusively to Comic-Con attendees while supplies last. The piece by artist Matt Ferguson, known for his work with both Marvel Studios on the Phase 1 box set, showcases Agent Phil Coulson, Melinda May, Grant Ward, Skye, Fitz, and Simmons, alongside Peggy Carter. What will be the fallout from Ward's betrayal? Find out when Marvel's Agents of S.H.I.E.L.D. returns TUE SEPT 23 9|8c.